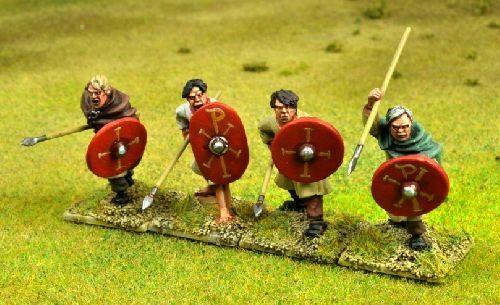 Four spearmen figures, designed for use as 'Arthurian', Sub- Roman/ Romano British armies. Can be used for most Dark Age armies. Figures are supplied unpainted, are 28mm sized. Spears not supplied, please look to spear pack NSS102 for the most suitable. Figures painted by Jim Bowen.